“Busking” is an English word for “street performing”. Buskers entertain passersby in return for voluntary donations. They rely on the tips of people they have successfully engaged and entertained. Why Should I Care About Busking? - It is immensely varied and truly popular, as in ‘people to people’. - It’s democratic, funded voluntarily by an appreciative audience. - It enables artists to find out where their strengths and weaknesses lie. - It alleviates poverty, and helps people pick themselves up from broken or dysfunctional situations. So, What is The Busking Project CIC? The Busking Project CIC is a non-profit, member-led “Community Interest Company”. We react to the needs and requests of our members and our community – street performers. See more about our company and social mission here. No. We registered as a for profit back in 2012, because it was the simplest, cheapest and fastest way of setting up a company (and back then we were only intending to make a documentary). But in 2017 we completed a 2-year process of converting the company into a Community Interest Company. See our history here. Can’t Community Interest Companies also make a profit? They can, which is why our “articles of association” (the documents that govern how our company is run and where the money goes) have strict conditions preventing us from getting rich off of this. No dividends are paid. Profits go towards making the company better. The only profit motive we have is to ensure this company is sustainable. To read more about our company structure and where the money goes, click here. What’s a Community Interest Company? A Community Interest Company (CIC) is a form of social business in which all of its actions have to serve the interests of their community – in our case, this means buskers. To read more about CICs, click here. Is The Busking Project a tech company? Sort of. We do have developers, and we do have a website. But, the majority of the work we do is hiring buskers for events, advocacy work, placemaking, event production, community building, networking etc. In other words, we are not just a tech company. See our team at the bottom of our about page. What Is Your Immediate Goal? To help stabilise the income generated by street performers, get people out of the house and to help buskers convince bureaucracies worldwide to stop arresting and legislating against them. What Is Your Long-term Mission? We want to live in a world where our best, most talented artists see busking as a platform to start up their careers; where urban planners design cities with art and culture in mind; and where everyone understands that buskers are a crucial part of city prosperity, walkability and community. You can always make a free account. But, if you’re full of ideas and want to help direct us, become a Become a Member (coming soon), which means you can come up with ideas and vote on where we spend our time and money. Who works for The Busking Project? The company was founded by Liliana Maz (Colombian) and Nick Broad (British/American). Over the years a lot of people have worked and volunteered for us, all over the world, but you can see the current team at the bottom of our about page. Can I work for The Busking Project? Maybe. Send us an email telling us why you specifically want to work for us, and what you can bring to the table. I don’t agree with what you’re doing, or you should be doing something differently. What are my options? Great. Let us know why you don’t like what we’re doing. I’m not joking, we need negative feedback, because otherwise we won’t learn. Either that, or Become a Member (coming soon) so you can vote on where we go next. Why should I pay to become a “member”? You can read more about our membership benefits here (coming soon). But, members also have voting rights, getting to decide what the company does; where we spend our time and money. Becoming a member also supports our work – there are few ways we actually make money, so it would be a huge help. I’m A Busker. Why Do I Need Your Help? Buskers are facing three modern problems: we’re moving towards a cashless society; the CD is dying out; and governments are cracking down on busking. You don’t need us, but we can help you get paid, and, when the government steps in, we can help you defend your right to busk. How do buskers make money on busk.co? In a variety of ways. Buskers can get hired for events. They can get tipped via their profiles, with Apple Pay, Android Pay, card payments and PayPal (just share your URL in the street or online). And they can upload and sell music. We make money through Membership Accounts (coming soon), grants, donations, booking events and, if you sell music through our site, we take 10% to cover bank fees and hosting your content. We have also worked with clients to build websites for busker-themed activities around the world. So you’re a ruthlessly efficient corporate beast? We don’t charge people for most of the benefits on the site, we don’t mine/sell your data, we don’t take a commission on tips and we don’t have ads or sponsorships. We’re trying to make our service as free and accessible as possible for everyone, without putting our hands into your hats and without selling out. Why Don’t I See Any Ads On Your Site? We refuse to have ads or sponsors. We’ve got nothing against them per se...but busking is, to many, an anti-capitalist, anti-commercial, spontaneous, anarchic and beautiful act unsullied by advertising. It should remain that way. From what you earn, where does the money go? Something like 90% goes towards paying our documentary, development, events, design, placemaking and management staff. Which, if you can believe it, is currently just 6 people! We also have to pay for web hosting, our accountant, web services, office space, taxes and a handful of other little things here and there. The owners & managers of The Busking Project CIC are unable to get rich off of this project – we have strict locks in place to prevent that. Why should I pay to become a “member” of the company? You can read more about our membership benefits here. But, members also have voting rights, getting to decide what the company does; where we spend our time and money. Becoming a member also supports our work – there are few ways we actually make money, so it would be a huge help. Why do you have paid accounts? We have tried to ensure that free accounts still contain all of the important features that make our service worthwhile – the ability to get tips, get hired for events, sell music, network and get support. However, there are certain added features that were either costly to develop or are costly to manage, and are therefore reserved for paid members. Also, our paid members make us able to provide free profiles for everyone else! See a more in-depth look at all our membership benefits here. We have thousands of buskers signed up, more than we could ever personally know. So, we’ve created a “verification process” to add a level of confidence for clients looking to hire street performers. To verify you, we check out your show online, then book in a 5-10 minute call with the performer and a member of our staff. The call is just a simple chat, about your busking history, who you are and so on. It’s also a chance for you to ask us questions, to see how we might be able to help you further. After the call, you’re “verified”, meaning we know you’re an actual, real-life performer. See more about our membership benefits here. Something like 90% goes towards paying our development, events, design, placemaking, documentary and management team. We also have to pay for web hosting, our accountant, web services, office space, taxes and a handful of other little things here and there. And, we’ve recently started doing an annual buskerfest in Bogotá, Colombia. Our “articles of association” prevent the owners & managers of The Busking Project CIC from getting rich off of this project. See more about what we do with our money here. How do I get hired for events? There are three ways of getting hired through the site: (1) You create a (good looking) profile, and clients browsing the site contact you directly; (2) clients contact us, and ask us to find street performers for their events; and (3) you go to our events listings, apply for events that suit your show, and the client then chooses which applicants they want. What can I do to get hired more often? The most important thing is to create a good profile. This means putting up a good bio, nice promo photo(s)/video(s), and showing the awesomeness of your performance. You should also make sure you’re reading our events newsletter, where we post new events every week, and you can apply for the ones you’re interested in. To add trust with the clients, you can also get verified, a benefit we offer our premium members. See more about verification here (coming soon). What guarantees do you offer clients about the buskers? We are a platform that connects clients with buskers. We only know as much as you do about the buskers on the site. You shouldn’t think of us as a booking agency, but as a platform that helps make introductions for buskers and clients. Many of the buskers on our site are the best buskers in the world (some, we’d like to boast, are the best people who’ve ever picked up their disciplines). But, we make no guarantees that the busker you've selected is going to be awesome. This is a platform – we are not agents, we do not manage or represent the performers. It is important to note that we also don’t charge for this service. Any money that changes hands is voluntary, and only occurs when the client is satisfied with the service we’ve provided. See our terms and conditions. It is also important to note that SOME of the buskers on on site have been "verified" (see below). What guarantees do you offer buskers about the clients? We are a platform that connects buskers with clients. But, we only know as much as the client tells us, and make no guarantees that the client is going to be awesome. You shouldn’t think of us as a booking agency, but as a platform that helps make introductions for buskers and clients. We have thousands of buskers signed up, more than we could ever personally know. So, we’ve created a verification process to add a level of confidence for clients looking to hire street performers. To “verify” you, we check out your show online, then book in a 5-10 minute call with the performer and a member of our staff. The call is just a simple chat, about your busking history, who you are and so on. It’s also a chance for you to ask us questions, to see how we might be able to help you further. After the call, you’re “verified”, meaning we know you’re an actual, real-life performer. See more about our membership benefits here (coming soon). How does The Busking Project make money from these events? We believe what we do is valuable; we provide artists with opportunities, and we find artists for clients. We’re matchmakers. So, we ask both our street performers and clients to make a voluntary donation to us. We request between 10% and 20% of the budget for performers – this is the going rate in the industry. What Does The Website Let Me Do? Is this just a social network? No. First of all, this is a functional site, designed to enable cashless payments and increase your fanbase from the people you perform to in the street. You display a sign in the street sending people to your profile, where they can tip/hire you, become your “fan” etc. However, you can message your fans through the site, and the more fans your profile has, the higher up search lists you’ll be on the site. So there are elements to busk.co that are similar to those found in social networks. Is this just another online tool, like LinkedIn or Facebook? No. We aren’t trying to replace existing social media platforms. Rather, the app and website are intended to be tools you use in the physical world – to sell music, to get digital payments, the kinds of things you can’t do through Facebook. We’re getting people out of the house, away from their computers and into the streets to find YOU, performing LIVE. So, how should I be using this website? Step 1: Create a profile. Make it look nice, add your bank details (if you want to get tipped), upload your music etc. Step 2: Make a sign with your profile’s URL on it (something like busk.co/1234), and display it while you busk. That’s it. No sharing of cat videos, no endless stream of distracting, algorithmic nonsense. Just busk. It’s what you’re doing anyway, except you’ve added a sign (and a hat line, to tell people what the sign is – “tip me here”). And if there’s a lot of competition in your city with other buskers (e.g. London or New York), then it’s a good idea to try to get “fans” as well – this will make you appear higher up in search results. Why did you discontinue the app? The good news is, we’re looking into developing the “live busker map” for our website. And Apple/Android Pay work on web browsers, making the one-click-donate thing work on phones, no app needed! What Was The App About? The app (which was on iOS and Android) let buskers announce when and where they were performing. It generated a “live” busking map of the world. So, audiences could then go and find who was performing right now near them. They were also able to give one-click donations to street performers. How do I enable cashless payments with busk.co? It’s simple. You go to your settings page, where you can add your bank info and/or PayPal email. We use the secure cashless payment service called ‘Stripe’ to handle the bank info. So, on your settings page, you click “Connect Bank Account”, and then fill in the form. How do I accept cashless payments with busk.co? Hopefully we have all of your questions around accepting PayPal, card payments and Apple/Android Pay answered here. But once you’re set up, you simply have to get your audience to click the “TIP ME” button on your profile! Our site (thanks to Stripe) will automatically detect if they have Apple Pay or Android Pay enabled on their phone, and if not, they can still use card payments or PayPal. Stripe enables people to accept online payments over the internet. Stripe is one of the world's best and most secure online payment processors, and it offer a convenient method for exchanging real money in a safe way. You can think of it like another kind of PayPal – they help you buy/sell stuff safely, and in return they take a small commission. Read more about Payments and security here. How Do I Create A Stripe Account? If you click “Connect Bank Account” on your settings page, fill out your details on the form and you’re ready to go. What Should I Tell My Audience? Once you’re getting cashless tips, you should display a sign with your new URL on it (e.g. “busk.co/nick”) and/or tell your audience about it. We’ve written a post on what to say here. How much of the money will I get? First of all, The Busking Project does not take a cut – 0% of your tips goes to us. However, both PayPal and Stripe charge small fees for the transactions. So, you’ll lose between 2% and 8%, depending on the size of the donation (the percentage is lower on tips that are larger), and whether it’s a domestic (i.e. UK to UK) or an international (i.e. US to UK) tip. See exactly how the commission is calculated here. Are Cashless Payments worth the hassle? Yes. Already at least 10% of your audience is not carrying cash. So, the small commission you lose on digital tips (2-8%) is hugely outweighed by the increase in number of people who can give you those tips. In other words, you might be losing a small % of your tip from someone who paid you with Apple Pay, but you may have gotten NOTHING in cash if they weren't carrying any. Yes. There is one method that is proving very successful for some street performers. It’s called “DipJar”, and it involves people swiping their bank cards in a machine. It takes just a few seconds, so you can use it while hatting. If you buy one, use the code BUSK during checkout and receive a 10% discount on your purchase. How do I sell music via my profile? First you have to connect a bank account. Once you’ve done that, you can upload music to your profile, set a minimum (or a “suggested donation”), and start selling. To do that, either share your profile with friends, or, while you’re busking, display a URL in the street that sends people to your profile. “You may not own a CD player any more. That’s fine – you can buy my music here.” (Show them your profile’s URL). Step 1: paying you. They go to your profile. They click “get album”. They choose the amount to tip you. They enter their bank details. They click “Tip”. And that’s it. Step 2: music transfer. They will immediately get an email with a download link. If they’re on an Android phone, they just click the link, and your music starts downloading to their phone. If they’re on an Apple phone, they’ll have to wait until they get home to download the music onto their computers (blame Apple, not us). You will earn 90% of whatever the album sales for. You may change/set the suggested donation for your music or merchandise at your sole discretion. You’re responsible/liable for your own dodgy credit cards, debts, PayPal fees, sale fees, disputed payments and refunds. See more about the fees here. We may redistribute previously purchased copies of your music to users who have, in our view, received a corrupted copy, an incorrect file format, an incomplete copy, or suffered a loss of your music because they’ve simply lost it (i.e. hard drive failure, damage, theft etc). We won’t charge them again. How Much Will The Busking Project Earn from my music? Not much. First of all, Stripe takes a small fee on any transactions – between 2% and 8%, depending on the size of the transaction and whether it’s a domestic or international transfer. You get 90%. And we get the rest – a few pennies on every album sold. See more about the fees here. Internet shopping, the recession and out-of-town commercial centres have reduced both our need and desire to come to town. Commercial districts are being bought by BIDs, who hire private security to patrol these newly sterile environments. Cities are having all the life sucked out of them. Why is Busking A Solution? Buskers are lively, fun, engaging, hugely popular and get glorious reviews on tourism websites (indeed, in many places, tourists say that buskers are the only reason to visit an area). Buskers are “eyes on the street”, they make cities safer, they provide residents the chance for human contact with strangers, and they make a great space. Best of all, from an urbanistic point of view, they require no infrastructure – they are a fast, cheap and powerful resource. Local authorities are trying to bring people back to town. And yet, despite tight budgets and few sustainable ideas, authorities are hesitant to encourage street performers, in part because there is simply not enough data showing that busking has a positive effect. They worry about what they don’t know. We are also doing academic research on the social and economic impact of busking on cities, collecting data corresponding to UN Habitat’s Urban Prosperity Index. This is the first data of its kind, and can be used to prove to local authorities what we already know from experience: crowds of 400 people laughing and clapping in the center of town is good for us all. The idea of “Placemaking” is quickly gaining popularity. It is a multi-faceted approach to the planning, design and management of public spaces. 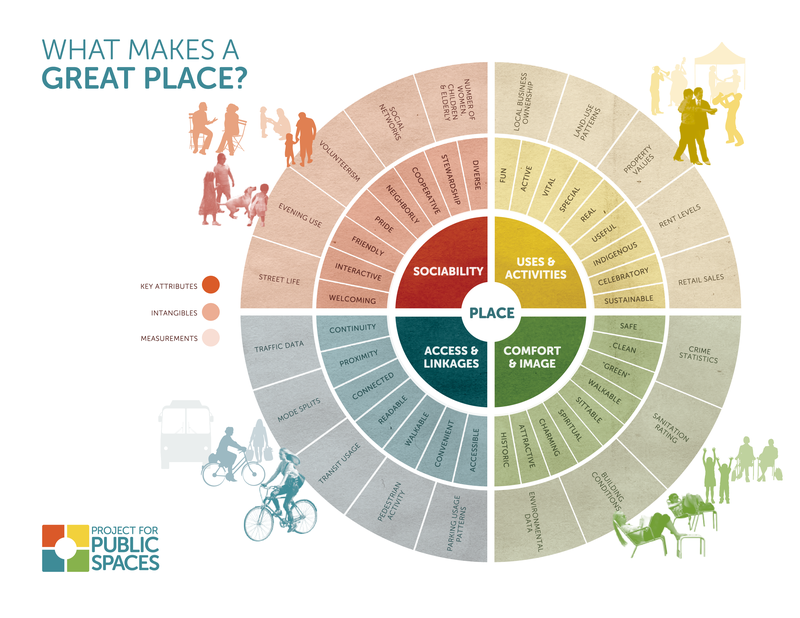 Placemaking capitalizes on a local community’s assets, inspiration, and potential, with the intention of creating public spaces that promote people’s health, happiness, and well being. We have partnered with The Project for Public Spaces, the world’s founding and leading placemaking body. They invited us to present to the UN in August 2014. We've hired the world’s only busking-focused placemaking academic, Vivian Doumpa, to both design our research and analyse our data. And we partnered with the Institute of Place Management in the UK in 2017. What Was The Trip About? Nick, Chris and Belle travelled to 40 cities on 5 continents in 10 months, spending 5 days in each city, trying to fly as little as possible in between venues. The aim was to do the first research about busking with a global perspective, producing a book, website and documentary along the way. We filmed performances and interviews, asking buskers why they started busking, what challenges they face and where they think this is going for them. In order: Lisbon, Marrakech, Barcelona, Rome, Athens, Istanbul, Mumbai, Jaipur, Calcutta, Jakarta, Singapore, Bangkok, Hong Kong, Tokyo, Seoul, Beijing, Moscow, Stockholm, Copenhagen, Vienna, Budapest, Krakov, Edinburgh, London, Columbia SC, Boston, New York, Vancouver, Seattle, San Francisco, New Orleans, Mexico City, Havana, Bogota, Lima, Cusco, La Paz, Santiago, Buenos Aires, Montevideo, and Rio de Janeiro – and all in ten months. Phew! Click here to see great videos from the trip. What Types Of Busking Did You Film? Mimes, graffiti artists, circus acts and street musicians are common worldwide. But there are some peculiarities we were really excited to film, like the monkey dances of Jakarta (difficult to watch), the tango dancers of Argentina (powerful), the mariachi bands in Mexico (ole! ), the snake charmers in Marrakech, the folk performers of Eastern Europe, the contact jugglers in Japan, and so on, and so on, and so on. Every time it got tough to continue, another exceptional act would give us the strength to go on. Yes and no. Not only were we living, eating and working with each other from dawn till dusk for 300 days, we were also constantly travelling on overland journeys that would take days to complete. It was incredibly, life-changingly stressful. It was also inspiring, exciting and beautiful. So a bit of both. And All Done In English? Actually, we recorded interviews in 10 languages(! ), using locals, hosts and friends as translators. Is The Film Ready Yet? We have (finally!) resumed post-production of the movie, and have finished logging of the 15,100 clips we got along the way. Our next step will be interviewing some of the key people in the world of placemaking and urbanism, and finding a director to take up the documentary. For now, click here to see some of our best footage from the trip.